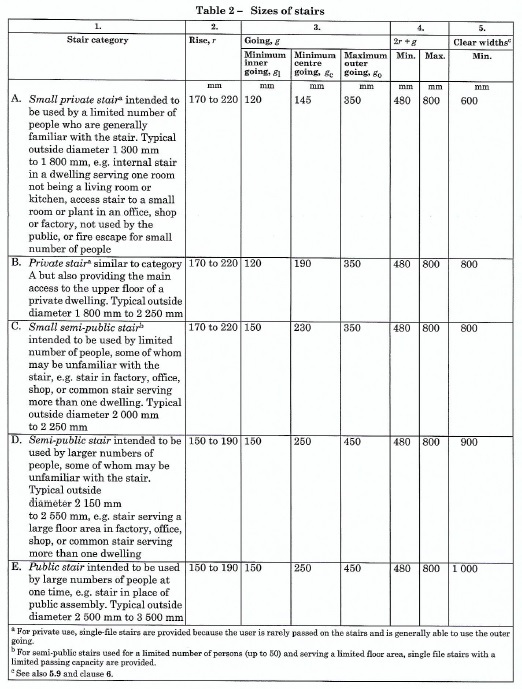 You are here: Home / Staircase Guides & Staircase News / Helpful Guide / Spiral Staircase Dimensions | What Size Diameter Do You Need? Spiral Staircase Dimensions – What Size Do You Need For a Spiral Stair? When it comes to spiral staircase dimensions, what size the diameter should be is an extremely common question in which there is no straight forward answer as it depends on the usage of the staircase. The requirements for spiral staircases in the UK are described in British Standard 5395. This groups spiral stair applications into categories A – E, with A being a lowly used secondary domestic spiral and E being a widely used fully public spiral. 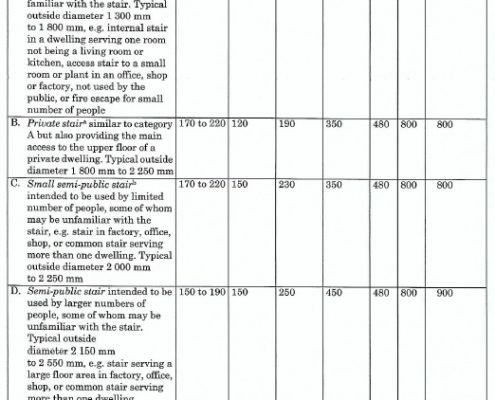 This document specifies the maximum height of each step, the minimum going (depth) of each step and crucially, to answer this question, the clear walking width. Logically, the more people who are going to be using the spiral, the larger the diameter and the more comfortable it will be to ascend. Click on the image on the right for a helpful table extract from the BS5395. These spirals are designed to be used by individuals ‘generally familiar with the stair’ and are classed as ‘secondary’ or ‘primary’. A secondary spiral stair assessing a loft, basement, or mezzanine will require a 600mm clear tread width. 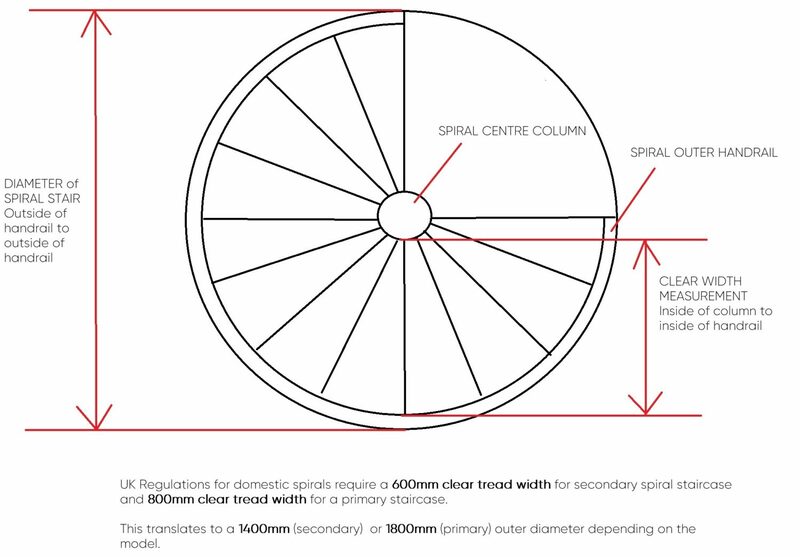 A primary spiral staircase within a dwelling will need an 800mm clear tread width. As the diagram below illustrates, the clear tread width does not refer to the radius – the centre column and handrails must be factored in to establish the actual diameter. This diameter will alter slightly depending on the diameter of the centre column and the handrail but is generally 1400mm for a secondary and 1800mm for a primary spiral. If there is space available, it is always worth opting for as large a diameter as possible. Use common sense and think about how often you might use the stair, how young or old the users might be and the type and size of furniture you might need to carry up or down. The final decision on spiral staircase dimensions rests with the building inspector involved with the project and they will specify which category is required. The BS5395 is there as a guide and can be sometimes be over-ruled by the local authority. For the floor opening required – please refer to our ‘What size opening do I need for a spiral staircase’ guide on our blog. Blog: What Size Diameter for a Spiral Staircase?